Similarly the 'TV' link has now been relegated to the more section, I'm guessing as it now redirects to part of the iPlayer site. Not that I tend to visit the BBC Three website, but as a brand you can see it slowly disappearing and fading away (as expected, after the channel closure). You can't get to bbc.co.uk/bbcthree from the BBC homepage, the Menu bar, or the iPlayer home page. Once you land on bbc.co.uk/iplayer, you also don't know Three exists until you go into "Channels" at the top. bbc.co.uk/tv now goes to the TV Guide, but as Three isn't a linear channel it's disappeared from there too. 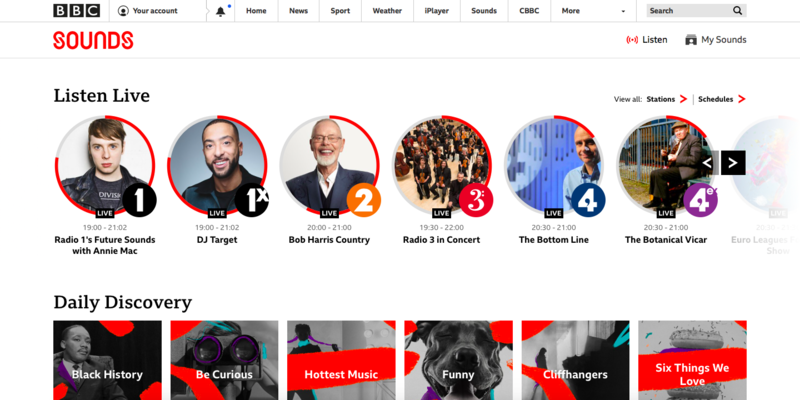 Not sure what I think of BBC Sounds, iPlayer Radio was always a bit of a mess and hard to navigate, but Sounds doesn't really scream "Radio and Podcasts" to me. Annie Mac’s changed a bit hasn’t she? I'm not usually one to moan about change, but this seems really underdeveloped at the moment. Just tried listening to Sounds of the 90s on the Sounds app, no tracklisting, no Chromecast support. I've no reason to stop using iPlayer Radio yet. There is now a Tracklisting on the new Sounds player pages on the website (that has replaced the old iPlayer radio player) but it has nowhere near the functionality of the Tracklisting on the episode pages - you currently can't play back snippets of tracks on the new pages, nor add them to the My Tracks list (formerly known as BBC Playlister). The other bit of functionality that doesn't quite work yet is easily moving to the next/previous episode of a programme, nor easily get to the Radio station home page related to a programme. I'm interested to see how the new Sounds idiom ties into the episode pages - within the iPlayer Radio idiom, the player played within the episode pages, so you could easily get around episodes and the various programmes' websites. Presumably these episode/programme pages will be tied into Sounds at some point - I do hope that various bits of functionality aren't lost for good. Has anyone else spotted this promo, it seem to be the BBC attempt to generate more traffic and praise for its radio and podcasts? It covers everything from songs to docs. ❤️ music. ❤️ radio. ❤️ podcasts. It must have worked because I've barely been able to connect to the app since the ad launched. I have noticed that the names on Twitter of a few of the BBC radio stations have been changed to eg 'Radio 2 on BBC Sounds'. Not sure if I like that - I hope it's not a sign of the branding shifting more in that direction. I heard "BBC Sounds" in a jingle on 6 Music this morning, doesn't sound right at all. Yeah, it seemed to catch Shaun Keaveny by surprise just after the 7.30 news this morning. Can only see this ending with it being rebranded back to radio in the not too distant future.